OJ: Alia what inspired you to make On a Wing and a Prayer? AS: I had been asked by Goldsmiths’ Methods Lab to respond to John Berger’s book A Seventh Man, which is a portrait of guest workers in the European Union in the late ‘60s and ‘70s. 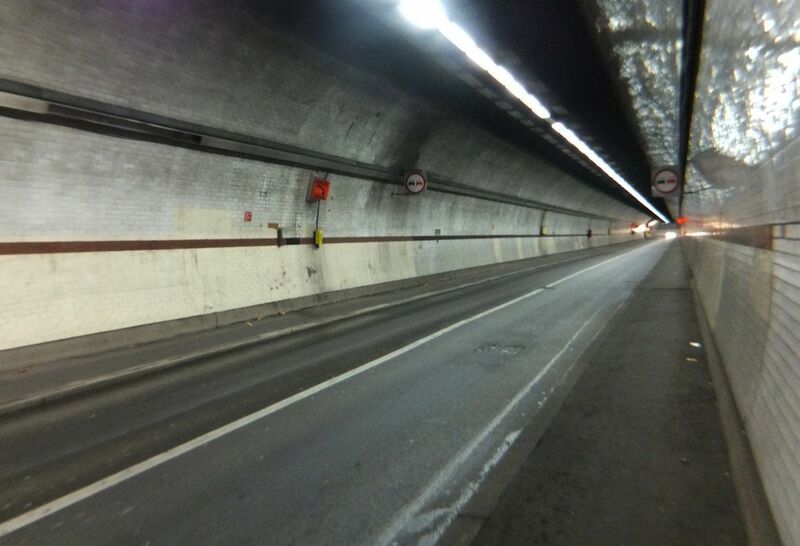 There is a point in the book where Berger describes the building of a tunnel underneath Geneva – the tunnel is being built solely to drain rainwater – and at the same time I was reading news reports of Abdul Haroun walking through the Channel Tunnel. These two things triggered something in me; I was reading about these two events at the same time and I was dumbfounded that somebody could survive walking through the tunnel, and I was equally dumbfounded that having survived the journey, he was then arrested at the other end. Also, my previous film Panopticon Letters became a journey down the Thames, because I was interested in filming the river in the same manner that Turner had painted the river, but I had to find a ‘free’ piece of sky because everything is so built up. So I basically ended up in Southend, and when you travel down the Thames you begin to understand, or physically comprehend how much military architecture there is… In Southend I came across military observation posts from the Second World War that were built to allow a clear view of the channel; so I was made aware of these physical boundaries; the space between the end of England and the beginning of France, and the way in which the Channel Tunnel penetrates those boundaries, and these three things coincided in my brain. I felt compelled to find a way to better comprehend this journey, so I decided I would walk through the Rotherhithe Tunnel. OJ: What was the most difficult part for you as an artist in carrying out this project? What did you find most challenging personally and professionally? AS: Firstly, there was the question of ethics; how much could one argue that I’m stealing his story for art? And then on another level; what was my responsibility to Mr. Haroun in making the film? On a professional level, what has been the most challenging is understanding how the individual is subject to the law, which is something that I had no comprehension of to begin with, and maybe have a very minuscule comprehension of now. OJ: I wanted to ask you something about ethics, you mentioned earlier oh am I using Harouns in story his journey to make a art so there’s an ulterior motive, would he feel that his story was being hijacked? AS: I don’t think this is Harouns’ story; the film is a response to Haroun’s story that continues a dialogue. I felt compelled to respond to his story, and in doing that I think I created my own story, and I think that is an important distinction. Unless we are suddenly made into political refugees and we have to flee Britain, there is no equivalence and I don’t think that’s what we should be thinking about. I think we should be thinking about how people find themselves in this situation and how much are we part of the situation that creates this thing that’s happening. That’s more important. I wanted to be able to recognise him in some way. My hope is that the film allows you to recognise something that goes beyond the idea of the victimhood of the person. When I first heard about Haroun’s story, the first thing I thought was people swim the channel and they are rewarded for that, they get a gold medal, or you can raise money for refugees doing that, and this man walks through the Channel Tunnel and is arrested. So there is this reversal in how different people are allowed or not allowed to travel geographies, land, boundaries, and these boundaries are there for some and not for others. SJ: And you chose a reading of David Herd’s text to accompany the visual part of your journey through the tunnel in the film? And he is speaking the text himself in the film? AS: I attended a conference at the ICA in London hosted by a research group from Kent University where David Herd was speaking; When I heard him speak, he had a particular intonation to his voice which felt like it belonged to an older England; the quality of his voice was the thing that compelled me to ask him to do the voice-over. I then read The View from Dover, which I thought was a brilliant piece of writing. 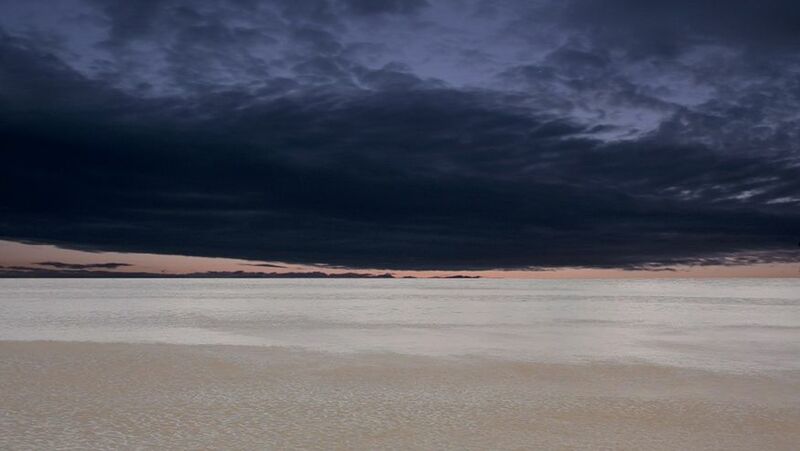 I thought it would be appropriate to use this in the film because it carried on this idea –that there is a journey through the physical space but also through the lawscape. To quote Herd’s text “The landscape surrounding The Citadel is heavy with law”. The text describes a detention centre in Dover – it is not specific to the space of the film, but I wanted to create a third space, an intellectual or emotive space within the architecture of the film, where there are different emotional points between what the audience see; and feel; and hear, so there is travel between those points. SJ: And the text shows also the continuity of the military defense of the country. UE: I think is interesting because you are looking at different journeys and how these different journeys run parallel – the journey to the tunnel, the journey through the legal system, and also the journeys along the River Thames. There are so many different layers and relationships, ways in which the relation of the subject to the law, and the relationship of the subject to space – both relate to law. In a previous project you were recreating Turner’s views of The Thames and they’re so often thought of as being quintessentially English and very much representative of English art. You couldn’t find this clear space of sky over The Thames, and it made you go to the mouth of the Thames, and that of course connects with other countries with other journeys. You were talking about the relationship of the subject to law, there is a question of; through that journey of migration, but also through that journey of law, how does the subject become a ‘rights bearing person’ or a ‘rights claiming person’? There are really interesting questions around citizenship and how that relates to crossing borders. What made you think of Rotherhithe? AS: Well it’s the nearest tunnel to my house. 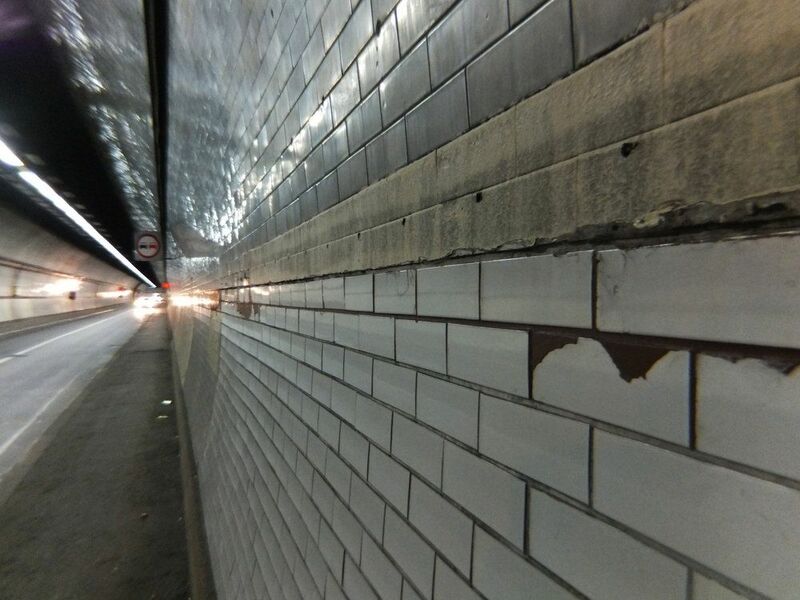 I had travelled through the Rotherhithe and the Blackwall tunnel in a car that the Rotherhithe is more atmospheric and it felt older because of the tiles which I’ve since found out are Victorian tiles. SJ: Which fits with the law from 1861. AS: Yes. But I didn’t know that; I just like the tiles. I had previously walked through the Greenwich foot tunnel, so initially I thought I should film my walk through Greenwich foot tunnel because it’s prettier. I did walk through the Greenwich foot tunnel but I wasn’t under any pressure walking in the Greenwich foot tunnel so I decided the Rotherhithe was the best. When watching ‘On a Wing and a Prayer’ one of the things that struck me was my own very strong visceral reaction. Watching Alia’s walk through the tunnel made me feel the narrowness of the tunnel, the bright lights and I held my breath whenever she turned away from oncoming cars towards the tunnel walls. I felt scared, I felt protective towards her, indeed I was angry that she would expose herself to the risk of walking the tunnel – without, of course knowing her at all! It is these reactions of mine, which made me, reflect on how important embodied ways of knowing about ‘risk’ ‘fear’ and also caring for an other, even an unknown other, are. Reflecting on my reaction to the film made me think more about the relationship of Alia Syed’s journey through the tunnel to Mr. Haroun’s journey through the tunnel. It raises the question of whether this Syed’s journey is a re-enactment, a phenomenological engagement with Mr Haroun’s journey and what the ethical and political challenges of this are. Is Alia’s journey a way to step into Mr. Haroun’s shoes? Can that ever be possible, and how would such a strategy confuse positionalities of relative privilege in terms of mobility rights and immobilities? In this sense I find Alia’s reflection on her artwork very helpful. She argues that this is not a way of telling Mr. Haroun’s story or re-enacting his journey, but instead a way of expressing her response to hearing about his journey and the judicial responses to it. Bringing her response to Mr. Haroun’s journey, as well as the ways in which immigration regimes, including detention centres and in this case the legality of obstructing the tunnel, to an audience takes on a different meaning for me. When re-focusing attention on Alia’s response, the questions raised in my mind become centred around what kind of relationalities we can build with people who are fleeing and whose journeys are full of risks because of the restrictions of national borders and immigration regulations. From this perspective, Alia’s journey through the tunnel, which we as audience can sense through the camera, becomes a way of reflecting on how to build such relationalities. How can audiences express their worry about and care for migrants? What are the possibilities and difficulties of building such relations of care, when the language of ‘care’ has at the same time been employed to present migrants and refugees as risks and threats to the British population and the smooth running of the tunnel channel and its profits? How can we think about these tensions and in turn respond to them in a politics that develops solidarities within and despite these tensions? Alia Syed’s recent works combine her interest in storytelling with a compelling presentation of history as visual narrative. Her unique approach sutures different subject positions in relation to culture, diaspora and location. She was shortlisted for the 2015 Jarman Award. She is represented by the Tawar Gallery In London her work is distributed by LUX. Sara de Jong is Research Fellow of the Strategic Research Area Citizenship and Governance, and co-lead of the SRA C&G research stream ‘Justice, Borders, Rights’. In various research projects, she has analysed the politics of civil society and NGOs in relation to migration, gender and development, employing postcolonial and intersectional approaches. Umut Erel’s research employs an intersectional approach and explores how gender, migration and ethnicity inform practices of citizenship Her current research focuses on care and citizenship among migrant mothers and their co-resident children. Olga Jurasz is a senior lecturer in law at the Open University Law School, specialising in international law and human rights. She is particularly interested in how various mechanisms of public international law address the long-term impact of armed conflict on women and how women’s rights are protected in the aftermath of war, during the process of transition from war to peace.